So, if you are totally drained and don’t feel like carving a pumpkin, why not attack it with a permanent marker? 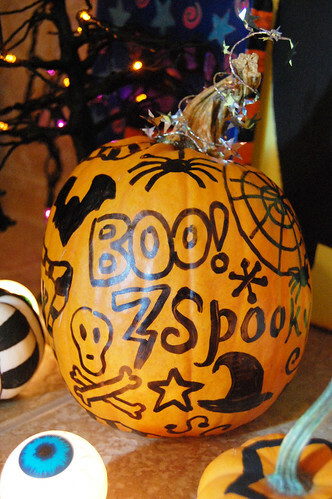 That’s right, a pumpkin doesn’t have to be carved or painted on, it can just be made totally cool with a Sharpie. Use a fine, wide or regular tip…whatever floats your boat! I simple drew different designs like skulls and crossbones, words, a spooky tree, swirls, stars, tombstones, and more. Just use your natural doodling style and have fun! You will prob. want to spray it with some spray sealer so the designs don’t rub off or get weathered. Hope you enjoyed this super easy project! Ahhh-permament markers save the day again. This is a fun and not so messy project. Thanks, Alexa! And a huge thank you for hosting another fabulous Terroriffic Tuesday Event!!!!! You rock, sister!!! Another brilliant idea from the Queen of Halloween! Thanks for hosting this again and for all you do to make the craftiverse a better place. Alexa, Sharpies are my friend as well. Great quick project! Thanks so much for letting me join this fun time with you all. Now this is my kind of “carving”. So simple. Thanks for sharing and thank you for ALL of the work you have put into the Terrorific Tuesdays. You ROCK! hi people. I’m really into shoes and I was searching for that meticulous model. The prices seeking the shoes are about 210 dollars everwhere. But finally I set this site selling them for the benefit of half price. I exceptionally want those [url=http://www.shoesempire.com]prada sneakers[/url]. I will definetly order those. what do you think? good evening friends. I’m actually into shoes and I was digging for the sake of that meticulous make. The prices as regards the shoes were approximately 300 pounds on every site. But for all I bring about this locate selling them for half price. I absolutely want these [url=http://www.shoesempire.com]gucci sneakers[/url]. I will probably buy those. what do you think? good day everyone. I’m actually into shoes and I have been digging allowing for regarding that singular make. The prices seeking the boots were all over 300 dollars everwhere. But definitively I found this area selling them as a remedy for half price. I really want those [url=http://www.shoesempire.com]gucci sneakers[/url]. I will probably order them. what can you tell me about these?